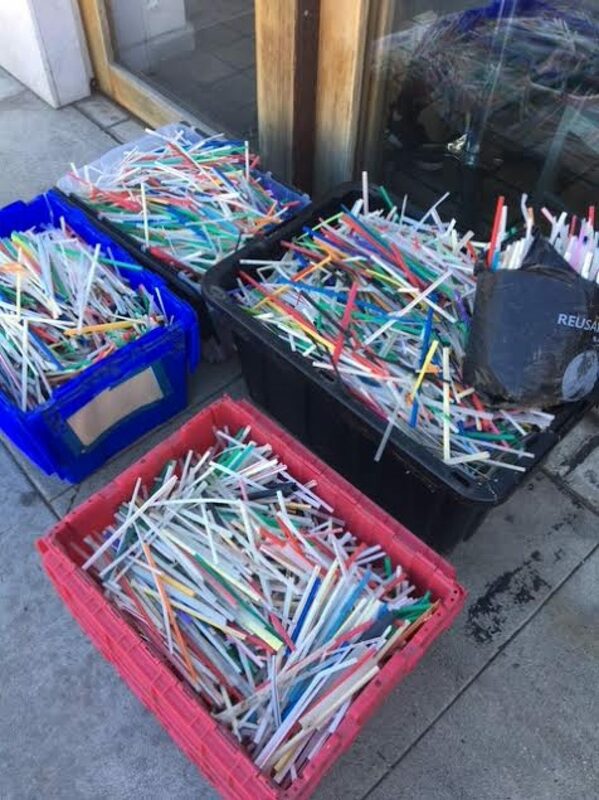 Berlin Bistro and Portfolio Coffeehouse owner Kerstin Kansteiner and Dine LBC founder Terri Henry are partnering up to bring the #nostrawchallenge to Long Beach. In an effort to reduce straw pollution, the two-woman team is intent on making plastic beverage straws a request-only item of the local dining experience. It’s a movement that has been gaining momentum in response to the short film “Straws”, which screened at the Art Theatre in November, Henry said. The mission for 2018 is to get more restaurants on board, alongside cities like Malibu that have banned dining establishments from giving out or selling plastic straws, stirrers and utensils. Kansteiner introduced the challenge to patrons of her 4th Street restaurant, Berlin Bistro, by giving straws to customers on a request-only basis and also by switching out plastic straws for compostable ones. Compostable straws are more expensive, but with customers using less straws the restaurant ends up breaking even, Kansteiner told Fox 11 this morning. When Henry got wind of Kansteiner’s no-straw initiative, she thought she could use her growing database of Dine LBC restaurants to push the movement citywide. However, Henry, who carries a reusable straw in her purse, said she found that local restaurants already have the straw issue on their radar. 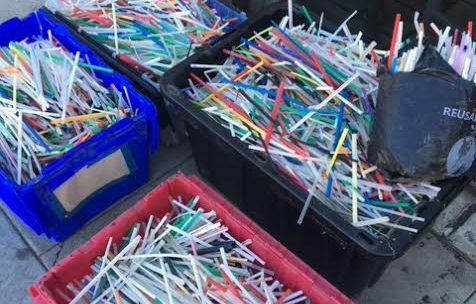 Straws collected over a period of five months by Long Beach resident and musician Steve Rice on his morning beach walk between Cherry and the Belmont Pier. Photo courtesy of Terri Henry. The World Economic Forum’s report The New Plastics Economy: Rethinking the Future of Plastics predicted that by 2050 oceans could contain more plastics than fish. Not to mention, Americans use 500 million straws every day amounting to a small fraction of plastic that ends up in the ocean every year, however, the mostly unnecessary plastic tubes are especially detrimental to marine life, according to National Geographic. There’s a sign up at Berlin explaining the eatery’s use of compostable straws. It reads that the United States of America makes up 5 percent of the world’s population, consumes 30 percent of the world’s resources, creates 30 percent of the world’s waste and that beach cleanups pick up 5,000 plastic straws annually, with plastic straws making the top 10 list of litter items found during International Coastal Cleanup Day. And while the state considers legislation to ban California restaurants from providing straws unless requested, Kansteiner and Henry are out to make sure Long Beach, especially as a seaside city, plays less of a part in that pollution.